Quick Read : How to use Chrome Browser without lagging. By using this chrome Extension. 0.1 What is OneTab ? You find yourself with too many tabs, click on this extension icon to convert all of your tabs into a list. When you need to access the tabs again, you can either restore them individually or all at once. 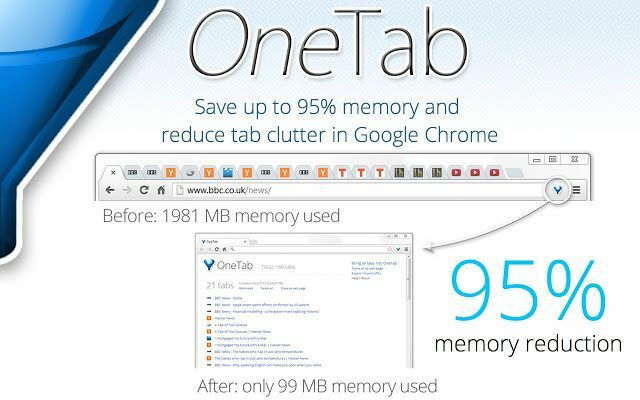 Your tabs are in the OneTab list, you will save up to 95% of memory because you will have reduced the number of tabs open in Google Chrome. It lets you easily export and import your tabs as a list of URLs. You can also create a web page from your list of tabs, so that you can easily share your tabs with other people, other computers, or with your smartphone or tablet. You can drag and drop tabs in your OneTab list to reorder them. You can also hold down the Ctrl or Cmd key while restoring tabs and they will remain on this extension list (meaning you can use OneTab as a way of quickly launching a set of commonly used tabs). OneTab supports retina displays. Note that OneTab is designed to leave in place any ‘pinned’ tabs you have. You will not lose your list of tabs if you accidentally close this extension window, if your browser crashes, or if restart your computer. How SD Cards are made ?